Boeing’s KC-46 tanker program has completed its planned Phase II receiver certification flight testing following three weeks of test flights with F-15 aircraft out of Edwards Air Force Base, California. Receiver certification testing started in April 2018 with F-16 aircraft. Since then the joint team also completed testing with KC-135, C-17, A-10, KC-46, B-52, and F/A-18 aircraft. The KC-46 tanker will be used to refuel US, allied and coalition military aircraft using its boom and hose and drogue systems and will be able to take on fuel to extend its operational range. 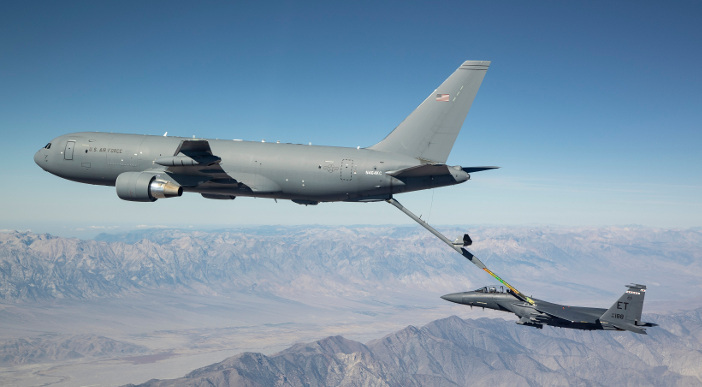 The boom enables the tanker to transfer up to 1,200 gal/min, while the hose and drogue systems, located on both the plane’s wing and centerline, enable the KC-46 to refuel smaller aircraft with up to 400 gallons of fuel per minute. During the certification flight tests, KC-46 and receiver aircraft flew at different airspeeds, altitudes and configurations to ensure compatibility and performance throughout the refueling envelope of each receiver. The US Air Force and the Aerial Refueling Certification Agency are now reviewing all of the test data before certifying each aircraft. Six test aircraft have completed more than 3,700 flight hours and supplied more than 4,000,000 lb of fuel in flight to receiver aircraft. Phase III receiver certification testing will be conducted by the US Air Force at Edwards Air Force Base in 2019. That testing will include additional receiver aircraft. The KC-46 is derived from Boeing’s commercial 767 airframe and is built at the company’s factory in Everett, Washington. Boeing is on contract for the first 34 of an expected 179 tankers for the US Air Force. The aircraft completed its FAA certification in September.